In the face of a continuing drought, Gov. Jerry Brown and Assembly Speaker Toni Atkins from San Diego introduced emergency drought legislation Thursday aimed at expediting $1 billion in water-related projects. A mild winter has done little to boost water supplies in the fourth year of the drought. Last week, NASA scientist and UC Irvine professor Jay Famiglietti reported that California has only a year’s worth of water left in its reservoirs. The emergency action announced at a Sacramento news conference includes a pair of bills — one to appropriate $1 billion from a pair of voter-approved water-related bonds and another to expedite contracting and create an office to “help disproportionately impacted communities respond to their water challenges,” de Leon said. “Taken together, this package provides a major boost to our state’s efforts to manage our water crisis and strengthen our current infrastructure,” he said. 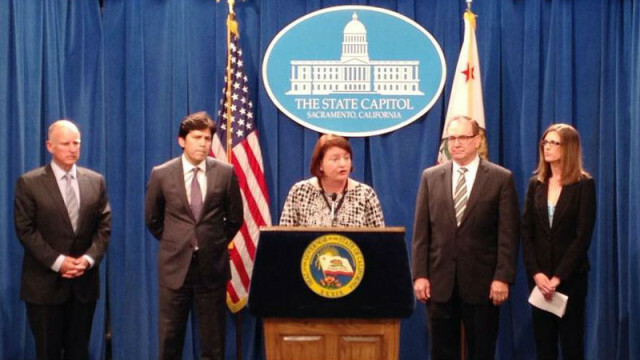 This marks the second consecutive year in which the Legislature has acted on emergency drought relief. In 2014, Brown signed a $687.4 million drought package that offered aid to communities facing acute water shortages and food and housing assistance to those harmed by the drought. The Legislature also crafted a $7.5 billion water bond that was approved by voters last November, with most of those funds earmarked for longer-term projects to bolster the state’s water infrastructure. The latest move comes amid growing concern about the drought, now entering its fourth year. The State Water Board tightened its watering restrictions earlier this week, telling urban agencies to limit the number of days residents can water their yards. They also warned that they will impose tougher restrictions in coming months if local agencies don’t ramp up conservation efforts. According to the governor’s office, the state has pledged more than $870 million to support drought relief since February 2014, including funds for emergency drinking water supplies in drought-impacted communities and for water- saving projects in local communities.